"Herøyhav" was moored for a few hours today in Breivika harbour. She left the port a few minutes after 18:00 this afternoon. Awesome images, especially this last one appeals to me. I think it’s the combination of essentially four colours, the play of the light on the water and the reflections in the black and red of the ship –and of course those elegant curves. Plus the feeling of being up close –it’s as if I could stretch out my arm and dip my fingers in the water, and when I look at this image for a while I can almost believe I see the water moving and hear it splashing against the hull. Fantastic images, Asimut. It's just like you are writing on behalf of me/us, Cecilia. This is certainly a great shot. Oh..., there's no on-coming train. I just remembered a comment to a picture I took in July. "Slettenberg" heading north this afternoon. 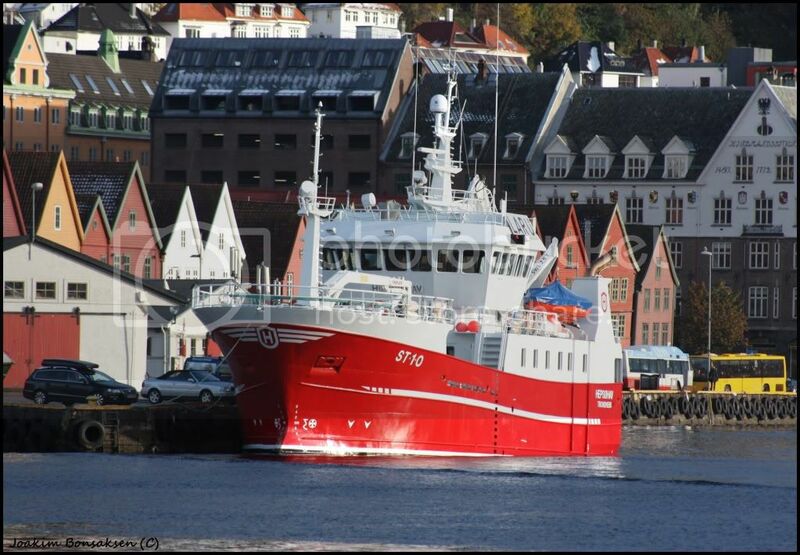 Scottish fishing vessel "Resolute" moored in Breivika harbor this afternoon. A fjord / coastal fishing boat "Kårøy" heading north earlier today. This one was built back in 1977. This type is usually operated by one or two people onboard. Thanks Asimut! I`m really pleased with it so far, well worth the money and perfect for shipspotting! "Geir II" at Fishermen Bait supply yesterday, to load the bait for the next trip. This is a good looking boat. "Resolute" on her way to unload 380 tons of herring in Tromsø yesterday. In the background there is a Orion plane on its way to land at Tromsø Airport. "Atlantic Star" heading to the pier yesterday.